Last year someone asked me what were my favorite podcasts. Without a second thought I referred my friend to the Mars Hill Audio Journal. Since 1993, Ken Myers has been using this audio journal to encourage conversations about faith, faithfulness, and culture, exploring the various factors that have given modern Western culture its distinctive character. Over the years this has involved Myers conducting interviews with a wide-variety of scholars on subjects that include art, technology, history, music, theology, philosophy, politics, film, poetry and almost anything else you could imagine. “that desire, however deformed, to perceive, to encounter being, is the very foundation of the possibility of falling in love with wisdom. …to remind ourselves that the world is beautiful tells us something about ourselves, that we can stand in contemplation before the world and not have to think ‘what are we learning this for?’ We’re learning it for the joy of it’s being beautiful. And also it tells us something about the world: that the world is itself, even in its most minute particulars, a kind of mystery, where even the crudest material thing conceals depths within itself…. The way Aristotle begins the Metaphysics…has always seemed to me one of the most beautiful few lines in our tradition. It, of course, begins, ‘all philosophy begins in wonder because human beings would practically rather see than do anything else.’ And what he’s proposing to us is that the world itself is wonderful; that is to say, the world itself is a mystery whose existence stirs us to wonder about it. And to wonder about it means both to desire and to know–to desire to know the truth. And so the world, just by its fact of its existence, inspires us to enter into that world with both our active will and our capacity to love and our capacity to know, our reason. So the world is a mystery that seems as if it was put there just to make us start thinking about it and contemplate it. I’ve been publishing some articles with the Colson Centre dealing with the debates between the medieval nominalists and realists, looking at the relevance these debates have for issues in contemporary culture. My teenage son and I sometimes get together with friends to watch movies and then analyze the worldview behind it. The last time we did this we watched Life of Pi, a movie based on Yann Martel’s book by the same title. The award-winning 2012 production is a beautiful drama full of stunning visual sequences which takes the viewer to the edge of fantasy while exploring important spiritual themes. Directed by Ang Lee, the movie opens with a man named Pi telling a writer of his perilous journey from India to the coast of Mexico following a disaster at sea. As Pi narrates his epic adventure, we watch his survival with an unlikely travel companion: a fearsome Bengal tiger named Richard Parker. Could God Have Been Incarnated As a Donkey? The Word became flesh and dwelt among us, Saint John declared in the opening of his Gospel. So far so good, but have you ever wondered if the Word could have become a donkey and dwelt among us? Or could the Word have been incarnate as a man and as a donkey at the same time? This question is not as far-fetched as it sounds. In Stanley Grenz’s book The Named God and the Question of Being: A Trinitarian Theo-ontology, Grenz tells how the philosopher William of Ockham (1288-1347) declared that God might have come to earth an ox or donkey. Other medieval philosophers disagreed with Ockham, and the matter became one of intense dispute. According to accounts left to us by Desiderius Erasmus (1466-1536), by the fifteenth-century scholastic theologians had moved on to trying to work out more subtle details such as whether God could have been nailed on the cross and sacrificed for our sins if he had been incarnated as a donkey. This wasn’t just an abstract question for medieval philosophers with too much time on their hands. Rather, it was a question that penetrated to the heart of an entire way of understanding the world and God’s relation to it. For William of Ockham, it was important to emphasize that God has no attributes apart from His freedom to be free from all attributes. Concerned—not without some warrant—that the dominant scholasticism of his day was domesticating God, turning Him into a civilized Aristotelian, Ockham asserted that God’s saving will-acts must be unconditioned by any factors outside the Divine fiat, including the past history of God’s works. Indeed, Ockham insisted that God could even produce in human beings knowledge of a non-existent past if He wanted to, although he never went as far as some of his contemporaries (particularly John of Mirecourt, Gregory of Rimini, and Pierre d’Ailly) in suggesting that God could actually undo the past. What was lost within the framework of Ockhamist nominalism was any sense of a moral order rooted in the teleological directedness of creation. The raw command of God—unconditioned by any factors outside itself—becomes the only mechanism by which we can assert a static moral order, however arbitrary that order might ultimately be. This understanding doesn’t exactly leave us with a random world in which anything might happen, where vices might become virtues and virtues might become vices, since Ockham made clear that once God had freely exercised the Absolute Power to create the world in a certain way, He will continue to act consistently in that way. However, this system did imply a world in which the moral and teleological order that we find in creation is radically contingent, derived only from God’s will acts. Accordingly, if God had wanted to, He could have commanded that adultery, theft and murder to be right, while He could have ordered kindness, self-sacrifice and love to be sinful. In the first article of this series I offered an alternative to this radically contingent view of reality. Following the realist vision articulated by Alister McGrath in his Scientific Theology: Volume 2: Reality and by Oliver O’Donovan in his Resurrection and Moral Order, I have suggested that God’s will is not the ultimate source of moral values; rather, the ultimate source of moral values is the nature of how reality is. The obvious objection to this realist conception is that it seems to push God to the margins by giving us a standard more ultimate than God Himself. This objection fails when we recognize that God’s own eternal character is the source from which this rational ecosystem derives its meaning and legitimacy. Thus, when we recognize that falsehood is disordered according to the nature and final end of speech, this is because reality has its source in a God whose very nature is truth itself (John 14:6). The reason God could not have made adultery virtuous is because God’s will, like reality itself, is rooted in the unchanging constants of His Holy character. “God’s nature is righteous and therefore normative. God loves goodness because he is good, and therefore he commands goodness in his revelation to man. Therefore in one sense, God loves the good because it is good; the concept is not arbitrary. Yet he does not need to look outside himself for a standard of goodness. That standard is his own character…. Because God’s commands are supremely normative, the self-expression of God’s supremely normative nature, they entail normative conclusions…. In the Apocryphal text The Wisdom of Solomon we read that “the whole creation in its kind was fashioned again from above to serve Your commands…” (19:6). Think about that for a minute: all of creation serves God’s commands. Whatever else this may mean, it points to a basic congruence between God’s commands and how creation is. Moral order flows out of the is-ness of creation, not the arbitrary command of God. This order of creation, in turn, is rooted in the is-ness of God’s eternal character which remains prior to, and the basis of, God’s will-acts. Since creation is an expression of God’s nature, there is a natural ordering to reality that we can observe and make appeals to. The world is an ecosystem of teleological and moral order, and that order is deeper than merely the sub-total of all God’s commands in the aggregate. Only with this understanding is it possible to fully appreciate the structural dimensions of sin. Sin is not simply an abandonment of isolated commandments; rather, sin as disorder; a turning away from the intrinsic telos of our human nature. Of course, one has to be careful when making appeals to the natural ordering of reality. Because we are fallen, our reason and our senses are not always ordered towards their true ends. God’s revelation is indispensable in our moral reasoning, and the danger of a natural law approach is that one can begin to think that Biblical revelation is irrelevant or an optional add-on. But in fact, it is only through scripture that we know that reality is ordered towards the Trinitarian God in the first place, and it is through scripture that we are given full insight on the ends towards which the world is ordered. Precisely because of this, the task to those who would grow wise is to meditate on God’s commands and discern the order to them, rather than just memorizing lists of rules. Indeed, throughout the Wisdom Literature of the Old Testament, we are told that the wise man is one who meditates on God’s laws long enough to discern their internal logic, the patterns by which reality is ordered, the principles which undergird and interconnect God’s various commands. This is a central precondition to being able to fully delight in God’s laws (Ps. 1:2; 119:97) since without this deeper understanding we are unable to fully appreciate the fittingness of God’s laws within the context of creational order. An analogy should make my meaning clear. When I was doing my undergraduate studies in music, I had a professor who could sit down at the piano and improvise in the style of any composer we might name. My classmates and I would shout “play Mary, Mary, Quite Contrary [or some other familiar tune] in the style of Bach” and he would proceed do it without even thinking. After a minute or two, we would say “switch to a Beethoven style” and he would effortlessly switch to sounding like Beethoven. We could continue through all the composers and each time he would improvise flawlessly in the appropriate style. There were two things that made this so amazing. The first was that this professor had never played these tunes before in that style: he was completely making it up on the spot. The second amazing thing was that he actually sounded just like the composer whose style he was imitating. How was he able to do this? The answer is simple: by becoming so thoroughly familiar with each composer’s music, he could sit down at the piano and almost ‘become’ them. If we consider how a person develops this skill, it provides an analogy for how wisdom works. Suppose my goal is to be able to sit down at the piano and “think” like Chopin, to be able to take contemporary songs and improvise on them in Chopin’s style like my professor did. In order to reach this goal, I need to do more than simply memorize all of Chopin’s works, although that would certainly be a start. I would also need to meditate on Chopin’s works, to analyse the patterns within them, to listen to them constantly, to continually practice adapting Chopin’s style to new melodic contexts. If I did that long enough, eventually I would start to notice the internal grammar by which Chopin organized his musical ideas. By being cognisant in Chopin’s unique musical logic, I could then apply it to new contexts and take songs on the radio and arrange them—perhaps without even thinking—to sound like Chopin. In a similar way, to grow in wisdom involves more than just memorizing raw commandments: we need to meditate on God’s commandments long enough to notice their internal grammar, their fittingness for this world, the principles that undergird and interconnect the vast array of commandments. We must allow God’s commandments to get “under our skin”, so to speak, in a way that can only be achieved through the application of those commandments in our lives (i.e., holy living). Only in such a way are we fully equipped to apply God-like thinking to new situations not directly covered by explicit commandments, even as my professor could take the style of Bach and apply it to new situations never touched upon by Bach himself. When the author of Psalm 119 declares that God’s commandments have made him wiser than his enemies, and that by making God’s testimonies His meditations he has gained more understanding than all his teachers (119: 98-99), he means more than simply that he could win a game of trivial pursuit about God’s laws. He means that God’s laws have become part of his whole system of thought so that he begins to see the world through the lens of God’s commands. He has hidden God’s word in his heart (Psalm 119:11) like the musician in my example took Chopin’s music into his heart. To be a theologian one must give extended loving reflection to God’s laws, like a musician aiming to know a certain composer’s music inside and out. But to achieve that type of depth of knowledge, the theologian must make God’s laws part of himself on every level: head, heart, hands and body. Hence, a true theologian must also be a mystic. The true theologian is the man whose life is devoted to contemplation, prayer and ascetic disciplines like fasting, almsgiving, prayer vigils and sacrificial love. In short, the true theologian is one whose life is devoted so completely to loving the Lord that the workings of his intellect proceed out of an entire life of spiritual devotion. That is why Saint Thomas Aquinas’s ‘16 Precepts for Acquiring Knowledge’ are almost entirely concerned with practical external matters, and only secondarily with what we might think of us intellectual concerns. One of the benefits of prayerfully meditating on God’s commands within the context of a life of obedience, is that we begin to see the fittingness of His laws instead of viewing them as arbitrary impositions on a neutral world understood separately from the Trinitarian God revealed in Jesus Christ. We begin to appreciate how God’s laws are the natural correlates to the is-ness of Christian. As a consequence, we are better able to take what the Bible says in one area, and apply the principles to other areas not directly addressed in scripture. This is because we are no longer simply looking at raw commands, but appreciating the moral order reflected in God’s commandments. This is essentially the task of wisdom as it has been practiced by saints and Christian mystics throughout history. Aquinas argued that there is a reciprocal relationship between knowing and loving. If you really love someone you want to know them, but the only way to really know someone is to love them. In this regard, it is no coincidence that scripture describes the nuptial union between husband and wife in terms of “knowing.” Similarly, to truly know God, one must love Him – not in the sentimental feeling-based way that we have come to associate with the word ‘love’, but the type of love expressed in doing what God has commanded. To summarize, the true theologian is a student of how reality is, and the eternal patterns disclosed in the teleological and moral order of creation. However, in order to truly discern these patterns, the theologian must allow God’s commandments to soak into every fiber of his being through living out the reciprocal relationship that exists between Being, Loving, Knowing and Doing. In the first article of this series, I briefly mentioned about the English Friar, William of Ockham. Building on the work of Aquinas’s contemporary Duns Scotus (1250–1308) and his own contemporary Petrus Aureolus (1280 –1322), Ockham helped to pioneer a school of thought to rival the realism of men like Aquinas. Realists like Aquinas had asserted that things have an inherent purpose according to their nature. Channeling Aristotle, they suggested that everything which exists has an end or telos which defines the natural perfection of that thing. The example I gave in the first article of this series was that the end or purpose of a hammer is to bang things while the end or purpose of a seed is an adult plant. Of course, this assumed the real existence of universals, so that we can make meaningful generalizations about classes of things like hammers, seeds, lions, etc. Ockham and his fellow nominalists challenged this ecosystem of symbols and denied the existence of universals. For them the world essentially became a random tumble of particulars, all appearing separately. Though we can look back and see in nominalism the roots of modern materialism, the original nominalists saw themselves as magnifying God. They believed that the realist approach meant that God was not completely ultimate since there are inbuilt limits to what He is able to declare good. To say that God’s will for a thing necessarily corresponds to what that thing’s nature already defines as its good, is to place a limit on the divine sovereignty, or so they thought. Thus, for nominalists like Ockham, God must always be free to determine what is good unconstrained by any other factors. God’s freedom thus became an autonomous freedom, no longer anchored in nature (including His own). Even Duns Scotus, whose teaching Ockham relied heavily upon, had admitted that the will of God was determined by his love. For Ockham, however, God’s will is determined by nothing. When we say that something is ‘good’, all we mean is that God happened to will it. In this way, Ockham sought to free God from the compulsion he believed to be inherent in realism. “For [Ockham], the divine will was totally free… Determined in the establishment of good and evil by nothing other than itself, the divine will could at any instant change what we considered to be permitted or forbidden according to the commandments, notably the Decalogue. God could even change the first commandment, and, for example, pushing it to the limit, command a person to hate him, in such a way that this act of hatred would become good…. Similarly, hatred of our neighbor, theft, and adultery could become meritorious if God commanded them. Ockham did not recognize in human nature any law or oder whatsoever that might determine the divine freedom and omnipotence. Behind their concern to preserve the divine freedom was a particular way of understanding God’s relationship to the world which we might describe as being a ‘zero-sum game.’ A zero-sum transaction is one in which the gains of one party are directly correlative to the losses of another party. The Nominalists seemed to think that nature existed in an inverse relationship with God’s sovereignty, so that whatever fixity or autonomy is granted to the former is that much less left over for the latter. Since God must have all the pieces of the pie, nature must have none. The practical ramifications of Ockham’s ideas were huge. If there are no universals, then there is no way to speak of a certain class of things (whether human beings, plants or hammers) having an inherent telos or goal which defines the natural perfection of that thing. The perfection of a thing is defined externally by God’s will, with no reference to the inherent nature of the thing itself. The way to understand a thing is by looking to see how God has categorized it, not by inquiring into its intrinsic nature. Despite the abiding influence of Aquinas on the medieval schoolmen, the nominalists were incredibly influential. We tend to think of Aquinas as the principal medieval scholastic, although it was actually the counter-reformation of the 16th century that assured his eminence. The Middle Ages were hardly characterized by a Thomistic consensus. In fact, by the mid fourteenth century, many of Europe’s top universities had rejected Aquinas’s realism and used nominalism as the principal framework for teaching natural and moral philosophy. By the time of the reformation various forms of nominalism had become the dominant view, though many still clung tenaciously to the older realist philosophy. Although I consider nominalism to have been one of the great disasters of Western philosophy, the alternative realist tradition also came with its own share of unbiblical baggage. Indeed, the scholastic emphasis on abstract essences brought with it theological liabilities that would become more pronounced as time wore on. Moreover, the fusion of Aristotelian and Christian categories, though it could be helpful in certain contexts, often came with disastrous results. Despite these qualifications, it does seem to me that the realist tradition gets closest to the truth. One of the reasons I think this is because of the testimony of scripture. Does the Bible presents a God whose will is anchored in the constants of His unchanging character, or does it portray a Being who is capricious, unpredictable and whose personality is simply the aggregate of His will-acts? A read through the Psalms and Minor Prophets should be sufficient to answer that question. This is not to say that there is no truth at all in nominalism. Ever since the Garden of Eden human beings have been taking dominion through naming things, and it is clear that some of the arrangements and configurations that we take for granted are not fixed in nature but emerge out of our voluntary naming activities. Where nominalism goes wrong is that it takes what is true under particular conditions and tries to absolutizes it, doing violence to God’s character in the process. Another reason I think realism is more compelling is because of observing the unintended ramifications of nominalism as it has played out in the centuries following William of Ockham. Many philosophers and historians now see nominalism as being seminal in the dualism between nature and super-nature, immanence and transcendence, heaven and earth, which lies at the heart of secular modernity. Space prohibits me from connecting all of these dots, and I can only recommend the fascinating discussions of these questions in Charles Taylor’s A Secular Age, James K.A. Smith’s Introducing Radical Orthodoxy, Brad Gregory’s The Unintended Reformation, Servaes Pinckaers’ The Sources of Christian Ethics, Michael Gillespie’s Nihilism Before Nietzsche, Mark Noll’s Jesus Christ and the Life of the Mind and (my favourite book of all), Hans Boersma’s Heavenly Participation: the Weaving of a Sacramental Tapestry. While leaving these and other scholars to show how nominalism contributed to the advent of secular modernity, I would like to zero-in to a few practical areas where the canopy of nominalism still exerts a profound influence on our understanding of the world. But that will be the topic of some follow-up articles. The more one studies history, the more apparent it becomes that William Temple’s father had a point. In fact, we could state the matter in even stronger terms: there has never been a more powerful influence, a greater agency of change or a stronger force for good or ill in this world than that of human ideas. Such a statement may seem out of place in a society that has long since relegated philosophy (the science of correct thinking) to a specialist discipline. Reflection on ideas has little or no relevance to the world of everyday affairs, many people think. We have come a long way from the time when philosophy was considered to be the backbone of all the disciplines, including the sciences (indeed, the early scientists called themselves “Natural Philosophers”). A person’s life, motivations, priorities, agendas, conversation and assumptions are just some of the areas affected by our philosophy of the world, whether that philosophy is thought-out or merely implicit and unconscious. Often the most powerful ideas are those which exist, not as disengaged concepts in a person’s head, nor even as ideas that can be reduced to a set of propositions on paper, but as unstated understandings that create the ‘background’ for how we perceive the world and navigate social space. As I pointed out in the first article in my ongoing series on Gnosticism, these background narratives often find expression in inchoate practices, assumptions and conventions which implicitly ‘carry’ philosophical ideas even while those ideas may not be explicitly affirmed or self-consciously acknowledged. Over the next few months I hope to use this Changepoint column to draw attention to one philosophical idea which exists both as an explicit proposition and (more frequently) as part of the background for how we spontaneously understand our world. It is an idea that has its origins deep in antiquity and yet remains incredibly relevant to the present age. The idea I want to talk about is called nominalism. 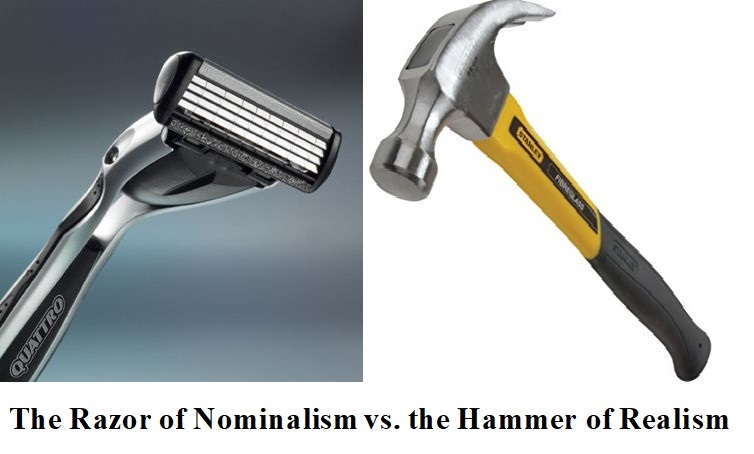 Nominalism is an idea associated with the English Franciscan friar William of Ockham, who was born in England sometime between 1280 and 1285. William of Ockham’s world was deeply influenced by the type of Scholasticism associated with Thomas Aquinas (1225–1274), which attempted to synthesize Christian theology with the insights of Aristotelian logic. Before we are in a position to understand Ockham’s alternative to the Thomistic synthesis, we need to understand a little about Aquinas’s worldview. Aquinas taught that things have an inherent purpose according to their nature. Using Aristotle’s nomenclature of causality, he was able to argue that the end for which a thing exists is the final cause of a thing, the sake for which a thing is what it is. Put another way, everything that exists has its own built in telos which is the end or purpose for which it exists. So the end or purpose of a hammer is to bang things while the end or purpose of a seed is an adult plant. This, of course, assumes the real existence of universals, so that we can make meaningful generalizations about classes of things like hammers, seeds, etc. The point about God’s character is key here. When the scholastics asserted that everything in the world possessed an inherent purpose or telos, and that God’s will conforms to the rational ecosystem of natures, it can sound as if they are granting an autonomy to the natural world which pushes God to the margins. This would be the case if it were not for the fact that they saw God’s own eternal character as the source from which this rational ecosystem derives its meaning and legitimacy. Thus, when we recognize that falsehood is disordered according to the nature and final end of speech, this is because reality has its source in a God whose very nature is truth. The reason God could not have made adultery virtuous is because God’s will (like reality itself) is rooted in the unchanging constants of His Holy character. In a follow-up article, we will consider how William of Ockham challenged this understanding, and the consequences this has had for Western civilization.